I started building Boats where I grew up in Costa Mesa, Ca. during the 1960's and 1970's. More Boats were built there during that period than anywhere else in the World earning Costa Mesa the Title of Boat Building Capital of the World. As a young man growing up on the Beach and in the Ocean and with an Interest in and Aptitude for Woodworking, I naturally gravitatied toward the Boat Building Industry. I started working on Boats at Kendall Yachts in 1970, building a 32 foot Double Ended Cruising Sailboat. The owner of Kendall Yachts, Larry Kendall, started me working in the Mold Shop and then moved me to the Carpenter Shop. Larry started every new worker at the bottom and had them work their way up the production chain, gaining valuable knowledge and skills along the way. 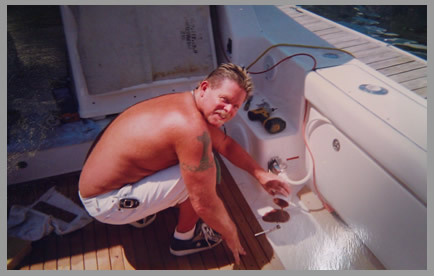 I served as an apprentice with Larry gaining very extensive training with Hand Tools and understanding the proper use of all the Power Tools used in Hand Made Boat Construction. Yachts where I did the One Off Custom First Boat Pattern Making etc. In 1980 I founded Fredriksen Custom Marine Woodworking, opening a Woodworking Shop in centrally located Costa Mesa. l began Customizing Yachts primarily in the Newport Harbor and now offer my Services from Playa Del Rey to Oceanside Harbors.